This year however, when xela asked me again I finally was able to agree to setting up a booth since I moved near Munich earlier this year, which made the distance quite a bit smaller for me. I started my journey after work on Friday and arrived late that evening, checked in at the hotel, found a place to eat and called it a night since the booth hat to be set up at eight in the morning on Saturday and the event was to start at nine. 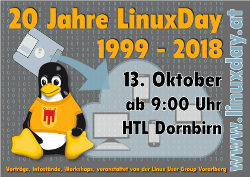 While in previous years there where no volunteers to set up a openSUSE booth in Dornbirn, this year after I registered one during the CfP luriv agreed to help out and traveled all the way from Chemnitz to Dornbirn, so I want to thank him for that. While there were some slow times, especially during the talks, there also was quite some interest so that there was almost always someone at the booth asking about openSUSE or giving feedback. Overall, even though it is quite a bit smaller than CLT for example, I think it was a success and if I can make it work I plan on going again next year. Last but not least I want to thank the openSUSE Travel Support for making it possible for me and luriv to get there and represent openSUSE at this event for the first time in a long while.